Mansour and colleagues recommend not routinely using the pulmonary artery catheter to guide hemodynamic management in the intensive care unit, because the perceived benefits are largely intangible . Pulmonary artery catheter monitoring of the right ventricular ejection fraction (RVef) and of the right ventricular end-diastolic volume (EDV), however, reflects powerful yet underutilized relationships that assess right ventricular performance. 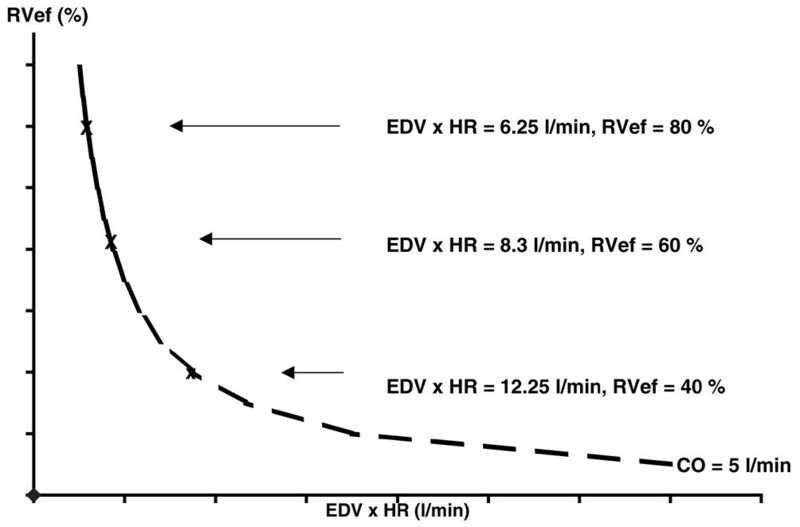 Since the cardiac output equals the product of the RVef, the EDV and the heart rate, one can assess the RVef to EDV relations as direct measures of right ventricular performance. A series of RVef, EDV and heart rate combinations can give the same cardiac output (Figure 1); monitoring or targeting cardiac output alone ignores this reality. For example, in hypovolemia the EDV is low and the RVef is increased, whereas in right ventricular failure the opposite is true. Furthermore, resuscitation from hypovolemia will increase the EDV and decrease the RVef , while reversal of cor pulmonale will decrease the EDV and increase the RVef. Right ventricular ejection fraction, right ventricular end-diastolic volume and heart rate relationship with cardiac output. CO, cardiac output; EDV, right ventricular end-diastolic volume; HR, heart rate; RVef, right ventricular ejection fraction. No monitoring device other than the pulmonary artery catheter can continually assess these variables. These concepts are often used in the cardiac surgery suite, but are rarely codified for diagnosis and management. Monitoring devices can improve outcome only if they are coupled to treatments that improve outcome. Applying the above logic to previously proposed treatment protocols, such as using the mixed venous oxygen saturation , may therefore be the first step toward defining pulmonary artery catheter utility .